During the 1950s and ’60s, South Palm Canyon between Baristo Road and Ramon Road was referred to as the “financial row” of Palm Springs because it was populated by so many financial institutions. Three of the bank buildings in the area were designed by the renowned local architect E. Stewart Williams: Santa Fe Federal Savings and Loan (now the Palm Springs Art Museum Architecture and Design Center); and two locations for the Coachella Valley Savings and Loan, the second of which is now occupied by Chase Bank. Coachella Valley Savings and Loan originally was built in 1955 at 383 South Palm Canyon and eventually was bookended by Williams’ other designs. The building recently was restored and given new purpose as a 4,200-square-foot event space. 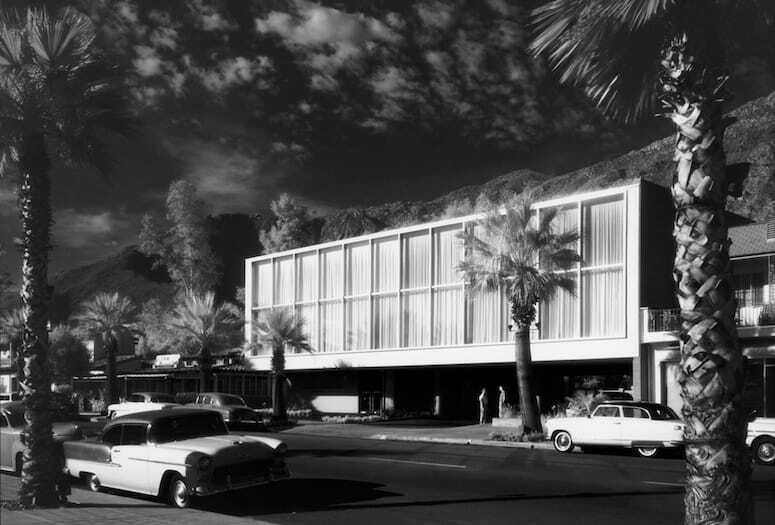 In a nod to its origins, it’s dubbed TheBank Palm Springs. “Any type of event can be held at TheBank: weddings, birthdays, corporate events, film screenings, dance parties, product launches, and many more,” says San Francisco-based designer and event producer Robert Fountain, one of the project’s partners. The others are local businessmen John McCoy and Michael Gambill, owners of Palm Springs Resort Homes. 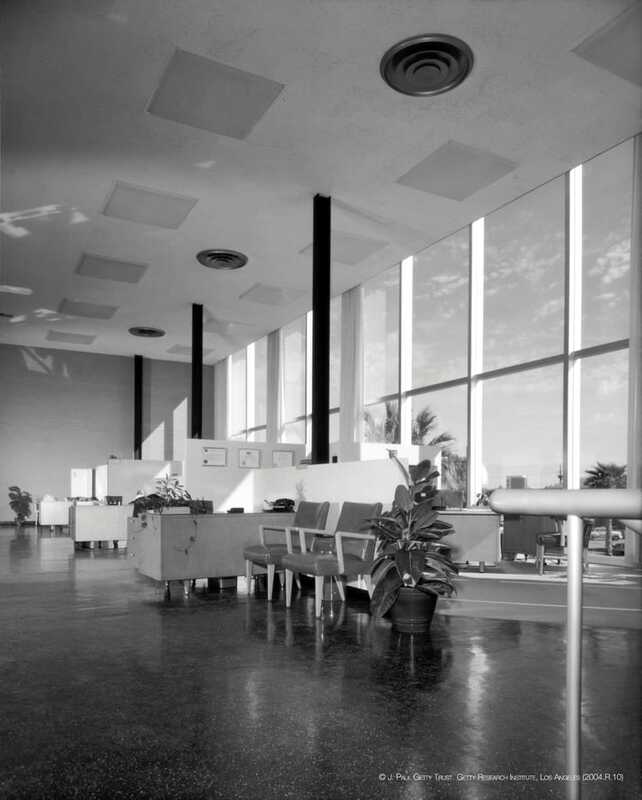 The main floor during its banking incarnation. 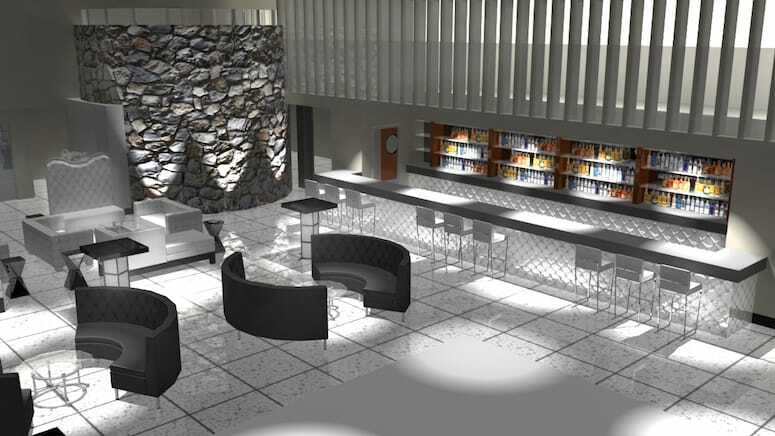 A rendering depicts the second floor as a sleek, elegant event space. The curved stone wall is used to conceal one of the bank’s vaults. In comparison with the elegant, sheer glass pavilion Williams conceived for Santa Fe Federal Savings & Loan, and his soaring, arched columns for Coachella Valley Savings and Loan’s second location, his design for 383 South Palm Canyon appears somewhat austere. He’s also a fan of the stone wall that wraps around what used to be a circular bank vault and is now designated a VIP room. In addition to the stone wall, some of the other original design features that are still present include the bank’s black terrazzo floors, a freeform terrazzo staircase, wood veneer panels, and a wall clock. While maintaining the integrity of the building, Fountain notes that the space was repainted, a Sonos sound system with four zones was installed, and the building is now Wi-Fi enabled. 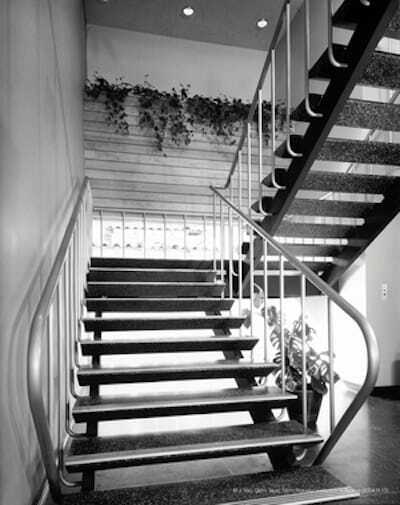 One of the building’s original features is its floating terrazzo staircase.